Is it possible that the world class Wrapper magazine has never devoted an article to Dinosaurs Attack? THE HORROR! Let us rectify this oversight immediately! Of course, the "sophisticated" collectors could care less. After all, Dinosaurs Attack is one of the cheapest sets around. Full sets can still be found for just a few dollars. How can something so common be worth special consideration? The answer is simple: Because this set is one of the best ever made. Remember, card collecting shouldn't be about scarcity or condition, but about the art and text. Dinosaurs Attack is an exceptional series in both respects. Then again, maybe I'm biased. I have a special affinity for this set, and there hangs a tale. 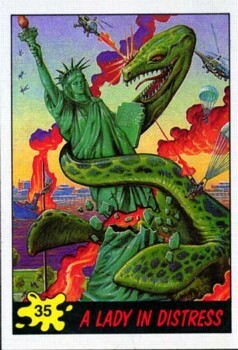 Back in the late 1980s, I was attending University in Alabama when I first saw some Dinosaurs Attack cards. I thought they were fantastic. They reminded me of the Mars Attacks series that an artist friend had introduced me to in California. I decided to return the favor and introduce him to Dinosaurs Attack. I bought an entire box and shipped it to him. I included a letter saying I thought they were one of the best sets ever, and asked if he had ever heard of them before. He never wrote back. I finally called him and asked why he didn't answer my letter. He responded, "I thought you were kidding. Of course I have heard of them. I was one of the artists!" In case you're wondering, the odds of that happening are 1 in 45,000,000! (That's 275 million Americans divided by six artists.) Yet happen it did. And not only was Hal Robins one of the six artists, but so was his roommate, Paul Mavrides. So perhaps I like them more than I should, because some buddies had a hand in making them. But I think not. I was blown away by them before I knew who was responsible. The real reason I love these cards is because they have everything going for them. Super artwork, plenty of action, lots of gore, an innovative story line, clever lay outs on the backs and sardonic wit throughout. I'm not alone in my admiration for this set. Wrapper dealer Denis Kramer also thinks this set is tremendously underrated. I asked him what he thought when he first saw the cards. "I thought it was a great set, because it's so graphic," Kramer answered. "It's probably the most graphic set I ever saw in my whole life. I can just picture if I were a ten year old or twelve year old, my friends and I would have gone crazy over this set. Look at the blood! Look at the guts! That's how little boys are, they love that crazy stuff." Kramer had never heard of The Wrapper back in those days (and neither did I). So he had no advance warning of what Dinosaurs Attack was all about. "When I first saw the set, it was already out a year or so and everywhere," Kramer explained. "[I stumbled across it] at a flea market. The artwork on the box caught my eye. I bought all the packs. It's a wonderful set because if you take the time to read it, it's like the original Mars Attacks. It's a good story. It's cohesive, interesting, and graphic. It's very underrated. It's hard to say if that set will ever get the recognition it deserves, because it's already been 15 or so years since it came out." Another big fan of the Dinosaurs Attack series is Jim Nicewander. Nicewander was the founder of The Non-Sport Report, which later became Collect magazine. Nicewander devoted two issues of his Report to Dinosaurs Attack (Vol 6 No.1, and Vol. 6 No. 2, both published in 1989.) These in depth articles are rich with Dinosaurs Attack information. They provide background on all six of the final artists, as well as one of the pencil artists, Herb Trimpe. (John Nemec and George Evans also did final pencils.) There's also information on Gary Gerani, the creative genius who wrote the story. Gerani has written lots of other fun stuff, including a dynamite book on TV horror and science fiction called Fantastic Television, and the script to the 1989 monster movie, Pumpkinhead. 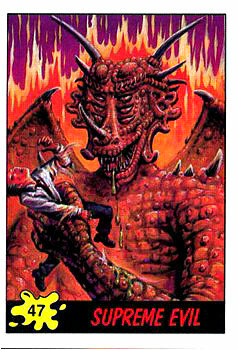 His image appears as Dr. Elias Thorne, the hero of Dinosaurs Attack. The artist who completed the lion's share of paintings is Chet Darmstaedter. Many people know him as the artist Xno. Out of the 54 card images, he finished a whopping 43 of them, or 80%. (#55 has no image.) So Xno is to Dinosaurs Attack what Norm Saunders was to Mars Attacks and Civil War News. Nicewander chronicles in his articles exactly who painted which card. Here's that list (reprinted with permission). Earl Norem did #24 (London in Flames), #29 (Monster in the Museum), #32 (Cat Lady's Revenge), #33 (Manhattan Island Swamped) and #44 (Entombed!). John Pound did #13 (Rock Concert Carnage), #18 (Tourist Trap), and #21 (Fast Food Frenzy). James Worholla did #8 (Crushing a Canine), #40 (Wrestling Riot), and #42 (Lights! Camera! Carnage!). The remaining 43 paintings were completed by Xno (Chet Darmstaedter). Hal Robins painted #1 (Allosaurus), #3 (Dimetrodon), #4 (Brontosaurus), #5 (Parasaurolophus), #6 (Plesiosaurus). Paul Mavrides painted #2 (Ankylosaurus), #7 (Pteranodon), #8 (Stegosaurus), #9 (Trachodon), #10 (Triceratops), #11 (Tyrannosaurus). Nicewander also produced a beautiful binder with additional background information on the artists, plus signed cards from all six of the painters, the three pencil artists, and Gary Gerani. The 14 page essay and ten autograph card collection is sold as a limited edition collectible for $100. Only 100 were printed. This was supposed to be one of a three part graphic novel series, but it was abandoned after the first issue. What a pity. If really flushes out the story in greater detail, and it would have been nice to get another twelve bonus cards for the set. Norem believes the comic stalled because the industry was imploding at that time. He said Topps' story was "a little gruesome in places, [but] I tried to dive into these stories and do the best I could with them." He also recalls Topps wanted his style to match the other artists. He mentioned they never returned the original artwork, and artists had to accept that condition if they wanted to work for them. He's retired now, at least from the commercial side of painting, because he doesn't like the deadlines. His career has spanned half a century. Like the great Norm Saunders, Norem's background included many pulp covers. Norem painted a lot of men's magazine covers, the kind that often featured scantily clad women being lowered into snake pits by evil Nazis and/or Japs. Norem's artwork usually jumped off the page. It's a technique he's retained throughout the years. Herb Trimpe did 32 of the pencils for Dinosaurs Attack. He began his career in the 1960s straight out of art school. He inked several issues of cowboy comics, including The Lone Ranger. He wound up working for Marvel and became the chief artist for the Incredible Hulk in 1968 (issues 106-122). He's rather amused his comic book character is now the star of a major motion picture. He's just as surprised that his work for Dinosaurs Attack is appreciated. "To me at the time, it was just throw away. [It was] fun, turning out the pencils. I knew it was going to someone else for the finishes." He recalls, "My wife liked it, [but] I didn't like it particularly. It was really over the top-- no pun intended. It was very strange. It reminded me of the things kids were interested in when I was in middle school. It was kinda gory." Trimpe's concern about the gore of the cards is understandable, because he happens to be a chaplain. His latest work in this regard was helping the recovery teams and victims at the World Trade Center disaster. Trimpe is also a writer and an adjunct professor of college English. Trimpe's multiple interests are nothing new. In fact, it was outside work on G.I. 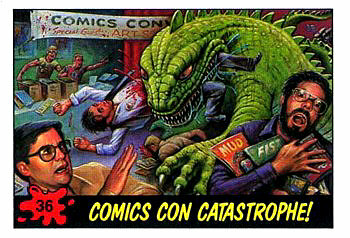 Joe comics that prevented him from being able to pencil the remaining 22 images of Dinosaurs Attack at the time. John Nemec was brought in to take up the slack. Nemec penciled #s 3, 9, 11, 14, 19, 23, 24, 28, 31, 32, 33, 36, 40, 41, 44, 46, 51 and 52. George Evans penciled the remaining four images, #s 1, 20, 29, and 37. 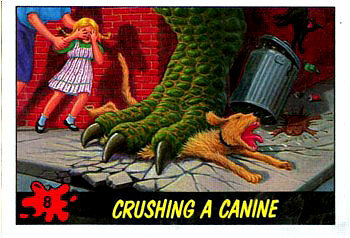 "Dinosaurs Attack has an interesting history because when I first did it in the late 80s, I brought it up to Warner Brothers and Joe Dante and they had optioned it. They were going to do a movie at that point before Jurassic Park was even written. I was the first one to bring back attacking dinosaurs chasing people and all that, which was like a 1950s type of thing." Gerani continues, "Warner was going to do it, Dante was going to direct it. He was very, very excited about it. And then the galleys for Jurassic Park started going around the studios, and everyone started saying, 'Well, it's Michael Crichton!' Speilberg jumped on it, then everyone else was afraid to do a dinosaur movie." What a shame Hollywood didn't have the foresight to realize that the public would pay to see more than one dinosaur movie. Crowds thronged to two more Jurassic sequels, the last of which employed the Dinosaurs Attack formula of putting prehistoric creatures into modern cities to create havoc and destruction. Gerani agrees. "I know, that was very Dinosaurs Attack-esque. They even had the bit with the little dog and the dog house. It had those little touches. 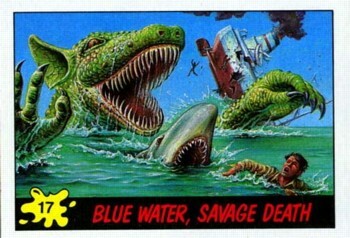 But Dinosaurs Attack was more fanciful. It was like a homage to the wild movies of the 50's which had no self consciousness. It was more inspired by the posters where the dinosaurs would tower over cities and be impossibly large. "And of course, our story line with Elias Thorne and the time tilter and all that kind of stuff, was much more sci-fi-ish. That's the kind of juicy melodrama that the movies I grew up with were all about. 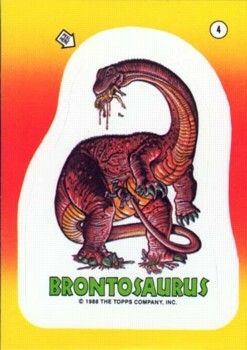 Dinosaurs Attack was meant to be half melodrama with touches of the parody and humor. The satire was built into it. At the same time, I hope that the melodrama of the central story and the fun of that melodrama would carry it through. I still think it could be made into a movie." "We actually rented a theater in New Jersey and we put up a marquis with our Dinosaurs Attack logo. We had a whole group of actors. It plays like a movie premier where you have an announcer who says, 'Welcome Ladies and Gentlemen to the exciting new trading card set, Dinosaurs Attack! And everyone is here tonight!' And they're interviewing kids and their parents. The kids are saying, 'Aw man, they're cool! They're great!' And the parents are saying, 'They're terrible, they're horrible!' And at the end of this, we see a dinosaur emerging from behind the theater, which was a puppet we had commissioned. It was a beautiful special effect, a T-Rex. The giant head of the dinosaur emerges and starts attacking and crunching the theater. Everyone is running for their lives. The announcer finally screams, 'Dinosaurs Attack! Collect the whole set! They're ghoulishly great!' It's 30 seconds long and they ran it in the afternoon during He-man and She-Ra, those kinds of kid's shows." Gerani revived the Topps employee cameo tradition for Dinosaurs Attack. "I ran around with my little camera taking shots of anybody and everybody, having them pose. I probably still have the original photos. Most of those faces in the set were based on real people, and 95% of them are folks who worked at Topps. "Our Forces Flattened (#31), that was Sy Berger, who was the head of the sports department at Topps for many, many years. 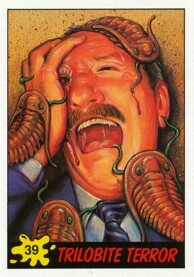 The Trilobite Terror (#39) was Stan Hart, who was one of Mad magazine's top writers and was one of our creative consultants. The fat guy watching the wrestling match (reverse of #40) has been at Topps for a million years. The other guy, the announcer was, I believe, the chauffeur to Arthur Shorin, President of Topps. I drafted Bob Galan as the reporter (reverse #43) and then the dinosaur breaks inside and attacks him and my friend, Butch Jacobs-- the black guy who's screaming in terror (back of #44). "Italy Under Seige (misspelled #10), that lady is Phillie from our mail room. We even worked in cameo appearances of real movie dinosaurs. In that particular image, you've got The Giant Behemoth pushing the leaning tower of Pisa over The Beast of 20,000 Fathoms. So like Roger Rabbit, I would sneak some recognizable dinosaurs into the mix." "Oh man, I gotta tell yah... It brings back memories about how much fun we used to have doing this stuff back in Brooklyn. It was before Topps became more grown up and corporate. You know, it was just looser and zanier and those were the good ol' days." 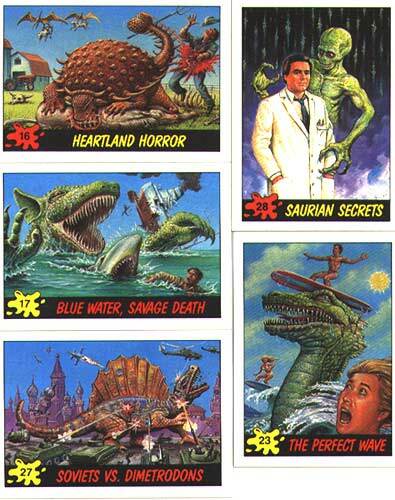 Dinosaurs Attack was Topps' last series to feature both original art and a continuous sophisticated narrative to tie everything together. It was a colorful, creative, and humorous work of art. 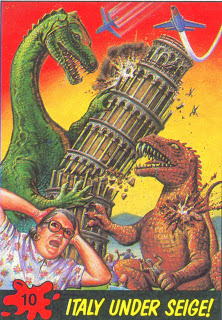 So the next time you see Dinosaurs Attack tossed into a bargain bin of dumped product, take some time to appreciate it. Rest assured, if it weren't so common, it would otherwise reside in a locked showcase with a hefty price tag slapped on it. This is one of the hobby's most eye grabbing sets. Its cheap cost makes it the perfect introduction to the wonderful world of non-sports cards. See an interesting round of Q & A with Gary Gerani, author of Dinosaurs Attack!